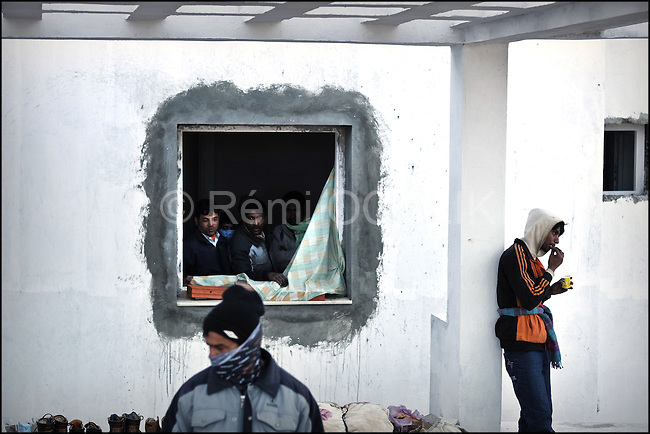 © Remi OCHLIK/IP3 - RA'AS AJADIR, Tunisia and Libyan border - Feb. 25 -- An Egyptian refugee smoke a cigarette in front of the tent he just finish to put up...Thousands of foreigners have fled Libya's chaos into Tunisia but many more are trapped, international observers say. Laurence Hart, chief of mission in Libya for the International Organization for Migration, said Friday more than 6,700 Tunisians have crossed the border at Ra'as Ajadir, along with Egyptians, Turks, Chinese and others. More than 2,000 Egyptians crossed the border Thursday night, said Malek Mayhoub, head of civil defense in Ra'as Ajadir.